After a quiet night in the tent, Clyde and Linda fed us a tasty breakfast of bacon, eggs and toast, which was wonderfully fortifying for the day. For the first part of the day, we left the headwinds behind. Our progress was rather quick and we arrived at the outskirts of Gambo within an hour. No far into Gambo we came across a stand selling fresh locally grown vegetables. This is the first fresh vegetable stand we have seen since leaving Quebec, so we had to stop and stock up. We skipped the giant zucchini, since each of them was more than 60cm long, but got some carrots, cauliflower and small yellow squashes. Yummy! Gambo is a rather long town, so it seemed like an hour before we reached the Trans-Canada highway. Before entering the highway, Becky was hungry, so we decided to stop for an early lunch (it wasn’t even noon yet). 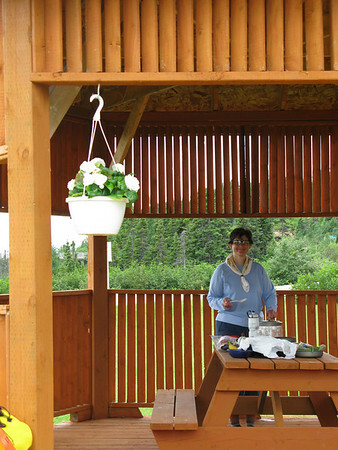 We didn’t find a restaurant that looked interesting – we have been eating too much deep fried food at lunch lately – so we stopped at a gazebo just before the Trans Canada highway and pulled out our stove and made up a quick instant noodle lunch. The first leg of the Trans Canada was going East, so we made quick progress. In the first three hours of the day, we were averaging 18 km/hr, which was a dramatic improvement over the 11 km/hr of the previous day. Unfortunately, this wasn’t fated to continue. As we turned into Terra Nova National Park, the Trans Canada quickly turned south and we were again faced with fighting a 25 km/hr headwind. It took us two and half hours to go 25 km! By the time we were ready to stop for the night, we had passed all the campgrounds in the park, and had not purchased a park pass, so camping by the roadside didn’t seem right. Fortunately, we were able to find a motel in Charlottetown Newfoundland (not to be confused with Charlottetown Labrador! ), which is enclosed by the park but outside the park boundary. The motel had efficiency units, so we could cook dinner in our rooms. The motel also had a bakery, so we got a nice loaf of fresh bread to make sandwiches for tomorrows lunch.